Water Level: 89% full. Click here for live Deer Creek Reservoir data. Main Boat Ramp is OPEN. Courtesy docks and wedge dock are in place. Island Boat ramp is OPEN. Wedge dock is in place. Charleston Boat ramp is CLOSED. The Charleston day use area primitive launch will continue to remain open for hand launched watercraft; as it has been for the last 3 years. We are working through a plan to replace the concrete barriers with with wood posts to delineate parking and to have a high water boat launch for small fishing boats. Additional Fishing Info: Fisherman reporting good success. 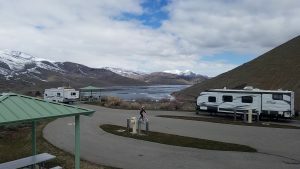 Chokecherry Campground is open for spring camping. Hookup sites are $20/night with electric and sewer hookup’s. Tent sites are $15/night. Extra vehicles pay the day use fee. Water is available at the dump station year round. Restrooms are available at the boat ramp. Great Horned Owl Campground is closed for restroom construction. Water is available year round at the dump station. Reservations are recommended for summer camping, and can be made up to 3 months in advance. Unreserved camp sites are first come first served day of only. Reservations accepted between May 15th and October 15th. Aquatic Invasive Species Information– It’s official! Deer Creek is no longer a suspect lake for Quagga Mussels! 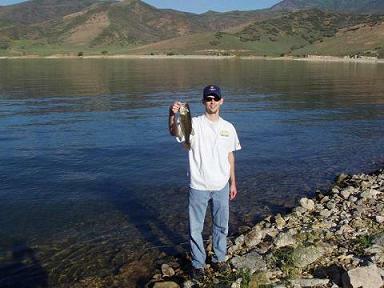 Boaters no longer have to wait the dry time period to launch at another water body in Utah. We encourage you to continue to clean, drain and dry to prevent the spread of mussels. All decontaminations require a prearranged scheduled appointment. Call 435-654-0171 and a Ranger will call you back to arrange an appointment. Deer Creek Island Resort offers boat rentals, food, convenience store, and wedding parties, call (435)654 2155 to make a reservation. Closed for the season. Uinta Kiting offers kite surfing lessons call (435) 647-6676. Island Aqua Park is closed for the season. Deer Creek Reservoir is located on the lower Provo River at the top of Provo Canyon, only about 25 minutes from the Provo/Orem area. It is approximately 3000 acres. The entire shoreline of Deer Creek is publicly owned, and access is completely unrestricted. There are two main boat ramps,	one at the state park, and the other at Rainbow Bay near the island). Water levels fluctuate annually based on yearly snowpack and runoff totals as well as water usage by downstream water users for both culinary and agricultural uses. The fluctuation in water levels also affects fish populations and many species of fish tend to go in boom and bust cycles. For example, perch populations grow substantially during high water years when there are lots of rocky and weedy shoreline areas in which they can spawn and survive predation long enough. Smallmouth and largemouth bass populations follow a similar trend. When water levels decline, there is nowhere for young fish to hide and they quickly fall prey to large predatory fish such as walleye, largemouth and smallmouth bass, and brown trout. Deer Creek is a very popular water for Utahns who like to boat and fish, due to its close proximity to the Wasatch Front and its easy access. It is located in the Heber Valley, at a crossroads of sorts between other fishing destinations such as Strawberry Reservoir, Jordanelle Reservoir, and Utah Lake. Walleye are probably the most extreme example of boom and bust cycles. In good water years, prey species (which include yellow perch, young smallmouth bass, bluegill, and trout) multiply dramatically. This causes a corresponding increase in Walleye populations. During drought years, or after the predator population gets too large, they literally eat themselves out of house and home, and this causes a crash in the prey populations. Once the prey base has dwindled, the walleye themselves crash, and then the cycle continues. As always, refer to the current year fishing guidebook. This site not guaranteed to be kept current.